Chop the carrot, radish, red pepper green apple, edamame and jalapeno into small pieces. Add salt,olive oil lemon juice and chopped coriander leaves. Heat a pan with little oil, add chili and urad dhal. 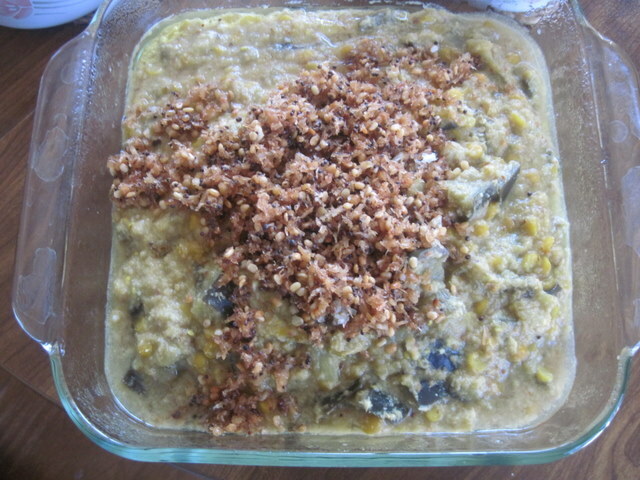 When the dhal becomes golden remove and grind with coconut and keep. Wash the kathrikai and cut into pieces. Boil water. add kathrikai, chana dhal, salt and turmeric powder. When kathrikai is cooked add the coconut paste and let it boil only once. Heat a pan add 2tbsp of coconut, mustard seeds, urad dhal and curry leaves. When the mustard seeds crackle add to the koottu. Olan is a Kerala recipe. It is very simple recipe.This is one of the curries for festival days in Kerala. Soak the black eyed peas into water for 5 hours. Boil the vegetables and black eyed peas with thin milk. When the vegetables are cooked add salt and thick coconut milk,coconut oil and curry leaves. Wash the bhindis and dry them . Heat a pan with 2tsp oil add mustard seeds, urad dhal and broken chili. When the mustard crackles add the bhindi, turmeric powder, salt asafoetida and chili powder. When the bhindis become tender remove into serving bowl.